You know what happens when you hold a garage sale? All those personal items that you have hidden away because you didn’t like them or they weren’t quite good enough to keep get exposed to light and inspected by strangers who often decide they’re not worth 50 cents. In some cases, they don’t even want them for free. Also, the people who gave you that “helpful hints” book you have placed on a card table with a $1 sticker or the goofy Christmas ornament on the freebie table show up and see that you decided their gift was not worth keeping. 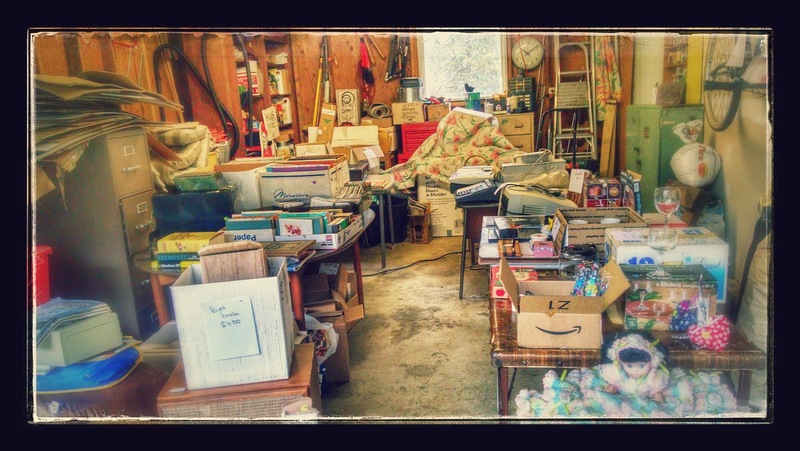 A garage sale is a lot of work for a little money, but you do get to meet a lot of nice people, including neighbors you never actually spoke to before and friends you didn’t know spent their weekends buying other people’s junk. It’s funny what people will and won’t buy. At the garage sale I held last Friday and Saturday in my actual garage, my first two customers were a couple of women who showed up early and ready to spend money. They got most excited about the bookshelf boards rescued from the great flood of 2013 in my den and bought them for $1 apiece. An outdoorsy-looking man who came a while later noticed a tall skinny log that has probably been in the garage since before we bought the house. It wasn’t even for sale; it was just holding up a rug. “How much you want for that?” he asked. That? He took it away for $2; he plans to make a table out of it. Or a sculpture. Or something. He was also interested in the big old clock on my wall, which was not for sale. Actually several of the men were interested in things that weren’t for sale, tools and such that were hanging on the walls. Nope, sorry, mine. Clocks did well. I quickly sold the two antique clocks that have passed through the Lick family and ended up here. It seems most people don’t share my aversion to chimes and bongs. The bike, the baby gate, and most of the wine bottle openers and corks went. I sold some books and CDs but not nearly as many as I expected to. I sold three out of four stereo components. But the records, TV, FAX machines, stereo speakers (giant) and typewriter did not sell. Nor did the bat house, and the croquet set, although they engendered much conversation. Seems what’s old and useless to me is old and useless to everybody else, too. Of course, the hurricane didn’t help. Okay, it wasn’t a hurricane, but it rained in buckets and barrels, and the wind, with 60 mph gusts, did not help. Tree branches littered the roads, my spa cover sailed across the yard again, and the cover on my compost bin left the property altogether. Windy. Nobody came Saturday afternoon, but I kept the store open, moving the merchandise back as the rain and wind came in. I wrote a poem, sorted through old magazines, played my guitar, played my recorders and danced to old music on the boom box. I sat with a heater at my feet to keep warm and gazed out at the waterfall cascading from the defective gutter over the entrance to the garage. At 4:00, I closed the garage door, took down what was left of my signs and started boxing up the remaining merchandise to donate to whoever will take them, with a few things destined for the dump. 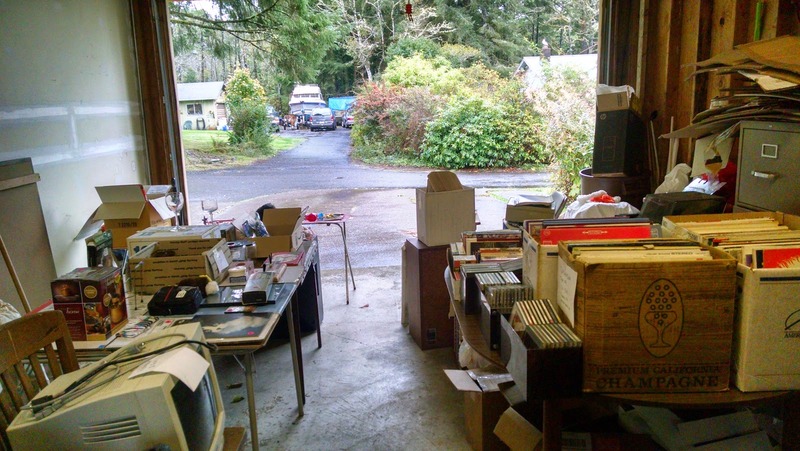 If anybody wants records from the ‘40s, ‘50s, and early ‘60s, and a lot of other cool stuff, they’re in my garage. But they’re not going to stay there for long. I’m going back to anonymously donating my stuff to charities, preferably those that will take them out of town so I don’t ever have to see them again. Thanks to Pat and Bill, who provided great help and moral support in the early stages of the garage sale. Also, thanks to the world’s greatest dog-sitter, Jo Byriel, who came to shop and ended up taking Annie for a nice long walk. I gave up on garage sales and now just give away my stuff outright. Or throw it away. They are SO much work! I agree, Karen. I might piggyback on someone else's garage sale, but I have no plans to do it again. Previous Previous post: Maybe we should change I-5 to "Dry-5"